BBC. "Tomb find reveals pre-Inca city." BBC, 2006-11-22. Retrieved 2006-11-27. Sican Archaeological Project. "Research Settings: The Sican Culture." 2007. Retrieved 2008-9-5. Sharpe, Colleen. 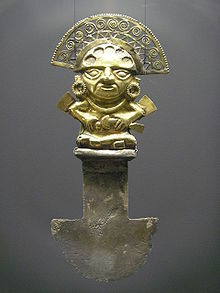 Ancient Peru Unearthed: Golden Treasures of a Lost Civilization. Calgary: Nickle Arts Museum, 2006. ISBN 0889533067.